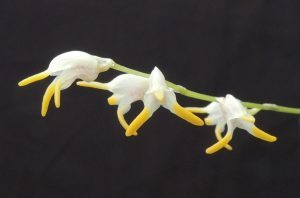 This is another of the delightful small multi-flowered masdevallias and this one is endemic to Ecuador. 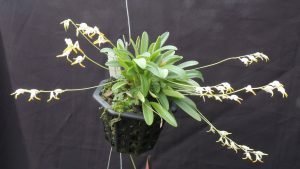 It is small growing but vigorous with 4cm leaves and 15cm flower spikes with about 6-12 flowers on each. As you can see it does well for us in a small basket though we also find it does well in pots. 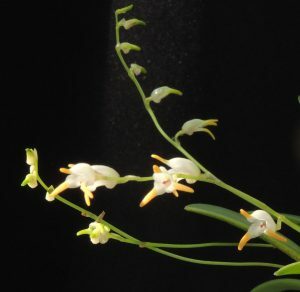 The species is found from 1800-2700m and so it is well suited to our Cool Americas section (Min 12C) where we keep it well watered and shaded. 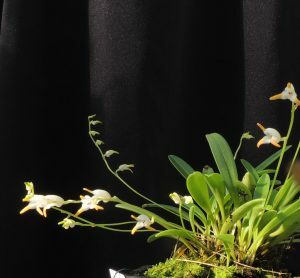 This species is found in a wide range of colour variants and we also have a brown and yellow clone but this is our favourite with crystal white flowers and yellow tails.